When Chester started as the first athletics director at Cap in 1973, there were no practice facilities on campus. 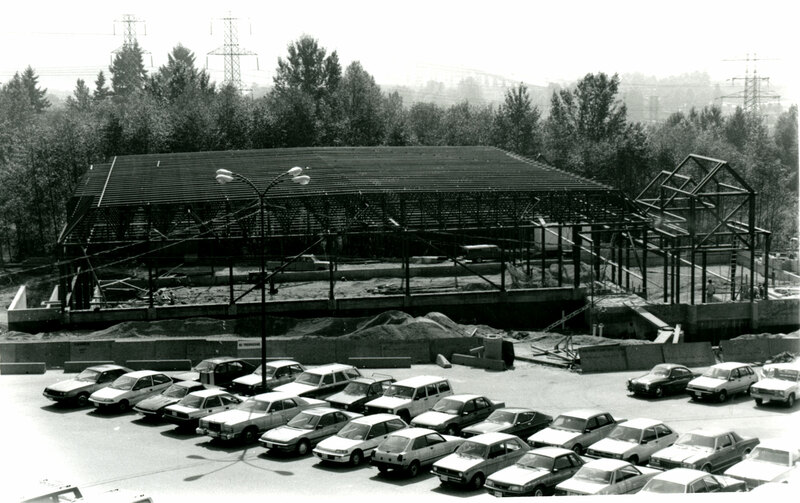 Teams practiced in high school gymnasiums and after Delbrook secondary school burned down, CapU leased time in its one remaining gym. Finding the funding was the greatest challenge to the project. “It wasn’t like money was growing on trees,” says Chester. “I was in the Interior, at the cabin, on holidays and got this panicked phone call saying that quantitative surveyor submitted their final budgets and we were short — $1 or $2 million,” he says. Designers returned to the drawing board and solved the problem by spreading out what had been a more stacked design. Then there were different ideas about the seats, bleacher-type seating vs. individual seats with back and armrests, mounted on a retractable platforms. “There were those of us that thought if we were going to make an impact on the community, it should be a place where the community could come in and run high school tournaments, do various and sundry things, and that required seating that was, at least, comfortable,” says Chester. In the end, retractable, individual seats were installed. “Finally having a facility that the community could actually use periodically enhanced our reputation,” Chester says. Today, the Sportsplex hosts Blues volleyball and basketball games, academic course work, community programming, provincial, national and international tournaments, special events and sport academies from the community. More than 75,000 people visit the Sportsplex each year.